Never cook on a re-heated skillet. Some of the best advice I have ever heard. As an Italian boy with a Jersey grandmother, it was meant literally. However, the premise that it is based on extends past the kitchen. Once you get warm, it is much more conducive to good work if you stay warm rather than shutting down to start back up later. For those long days at the races, the new Klim Pit Coat offers below-the-knee coverage of 200-gram 3M Thinsulate insulation to help keep you ready to go. Encased in a two-layer Gore-Tex performance shell, you can be comfortable knowing that you are guarded 100 percent against rain. Additionally, there is a removable hood that makes for an added level of utility and comfort. There is not even a reason to take off your gear as the coat is specifically designed to accommodate your full race-day regalia. All of the details have been thought out in this piece of gear, all of the way to the ergonomic alignment of the five total pockets and glove-friendly zipper pulls for the times when you don’t feel like taking your gloves off. Whether you are waiting your turn to hit the track or simply out in the elements as a spectator, having the right gear to keep yourself ready and comfortable is key. What you wear during the competition is only half of the equation. 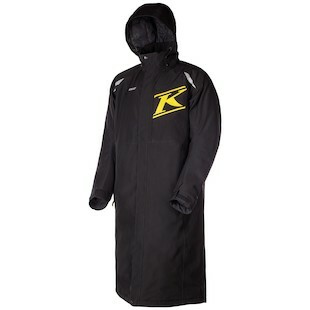 For the other 50 percent of the time, check out the new Klim Pit Coat.